Shredded Beef Taco Salad is a filling lunch or dinner for any day of the week! Miss Nichole from Pure Clean Fitness is here to hang out with us. I love having her visit and inspire our fitness! A Healthy Recipe, Shredded Beef Taco Salad from me + Back to School Chipper from Nichole = a healthy, happy, and balanced life! 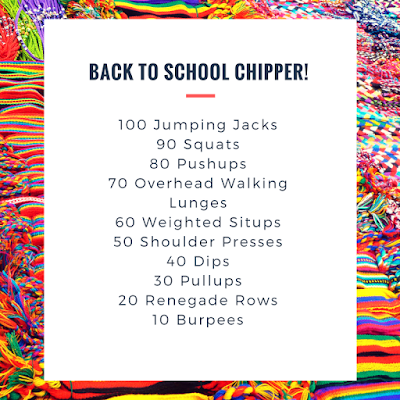 Miss Nichole’s Back to School Chipper. . .
We are back to school and back to routine, at least at my house. I am super excited about getting regular workouts back in at the gym! At least that is the hope, I am sure the school germs will be hitting the house within the next couple of weeks. Today we are celebrating having more than 20 minutes to workout with an awesome chipper. The trick to chippers is to break it up into small doable sections. Some of it is body weight exercises and some of it will require weights and a pull up bar. Push hard! Work hard! And get it done!!! Shredded Beef Taco Salad is a hearty and filling meal. . . if you love Tex-mex, then you’ll love this salad! Have an amazing Fit Friday! In a small bowl combine onions and cilantro; mix to combine. Divide cabbage between two serving plates. Top with beef, hot sauce, red onion, and onion/cilantro mixture. Season both sides of the flank steak with 1 teaspoon sea salt and ½ teaspoon pepper. Heat a dutch oven or heavy bottom skillet over medium high heat. Once hot add flank steak and sear on both sides. Add sliced onions, oregano, bay leaves, and beef broth. Cover with lid and simmer for 1½ -2 hours or until meat in tender. Drain the meat and let cool, cut into 2 inch cubes and using hands shred the meat. Hi! This looks delicious! Do you have a recipe for the shredded beef? Thanks!